I can feel the excitement in the air—we made it to premiere day! In case you missed it, Evelyne of CulturEatz and I teamed up to bring you Game of Thrones inspired recipes all week long in anticipation of the new season. We started Monday, and traded off days, creating 3 recipes apiece, and culminating with both of us sharing a recipe today with our chosen theme. Why do it like this? Well, it basically sprung from the fact that every month when we reach each other's Food 'n Flix posts, we find ourselves commenting about how we almost made the same thing...something similar...or something inspired by the same part of the movie as the other did that month. So, we decided to purposefully choose one scene/instance/theme from a chosen flick/show as inspiration, and see how similar (or different) our recipes wound up. 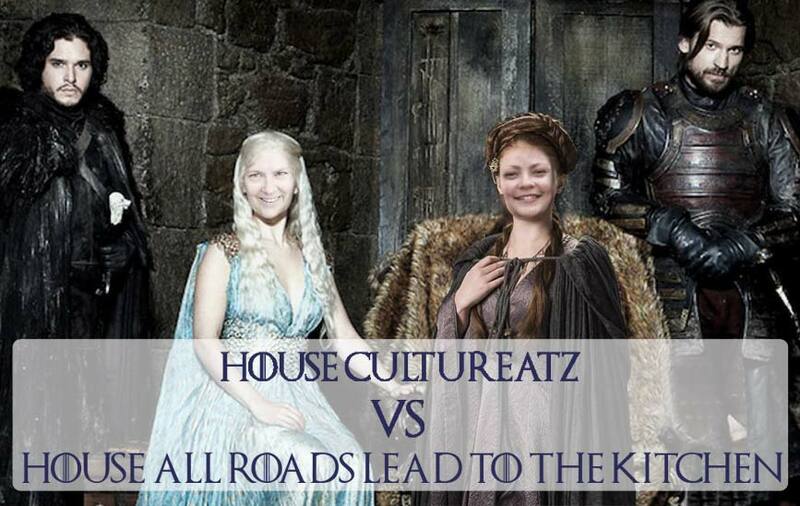 This was a couple of months ago, so once we decided that we'd cook from Game of Thrones in the week leading up to the premiere...and then to do a week's worth of recipes...we thought a chosen theme would be the perfect way to cap things off. Hence, a recipe from each of us today. 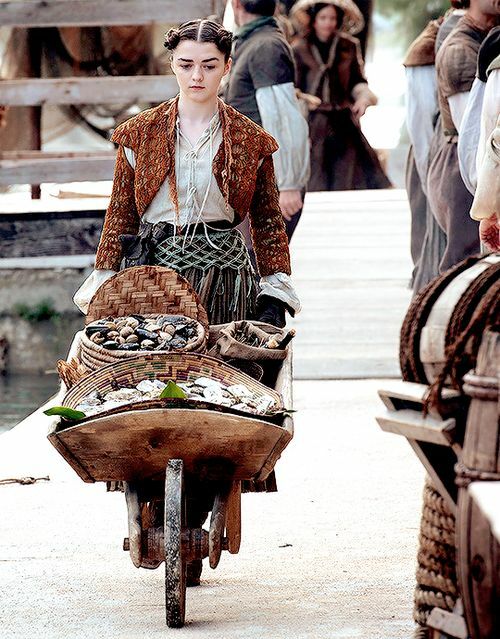 Our chosen inspiration comes from Season 5 Episode 8, when Arya, now in Braavos training under Jaqen H'ghar to become a faceless girl, takes on the identity of Lana, an orphan with an oyster cart. With her watchful eyes and sharp mind, she pushes her cart through the canal streets, repeatedly calling out "oysters, clams, and cockles!". Now, being on the sea, Arya's oysters and such are fresh ("best in the city"), I don't often have access to really good quality fresh ones, so I chose to used canned ones in my recipe. As Arya pushes her cart through the streets, smoke can be seen rising from fires of other vendors, so I created the flavor profile of this dish from what I imagine those streets smell like—smoky and briny. 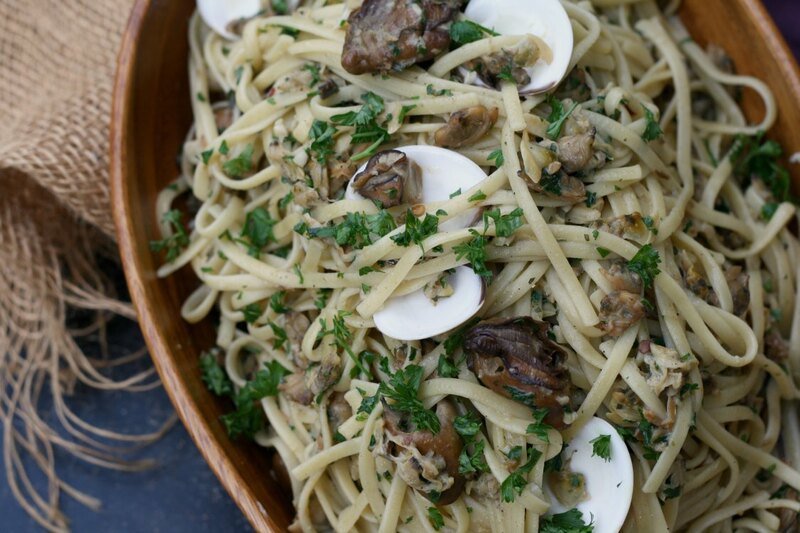 I couldn't actually find any cockles locally (and waited too long to order them online), so I've included a substitution in the recipe in case you can't either (extra clams). This dish is super simple, but it's packed with flavor and we devoured it as greedily as the captain did his oysters with vinegar. I hope you enjoyed this week as much as I did! I'm so ready for the premiere. Tell me—are you creating any Game of Thrones inspired food tonight? 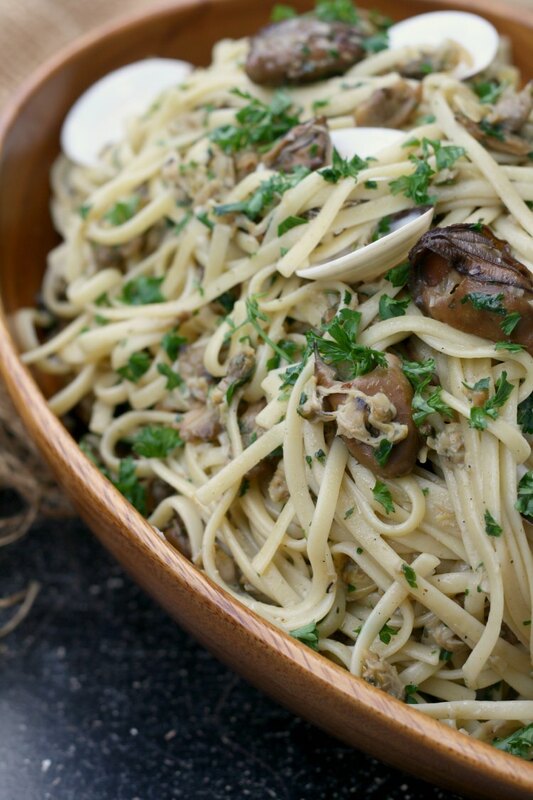 This simple pasta dish laden with oysters, clams, and cockles tastes of smoke and the sea. Cook pasta until al dente (according to package instructions). Before you drain it, saving 2 cups of the pasta cooking water; set it aside. In the meantime, heat olive oil in a large skillet with deep sides until hot. Add garlic and crushed red chile flakes and cook for 30 seconds, stirring constantly. 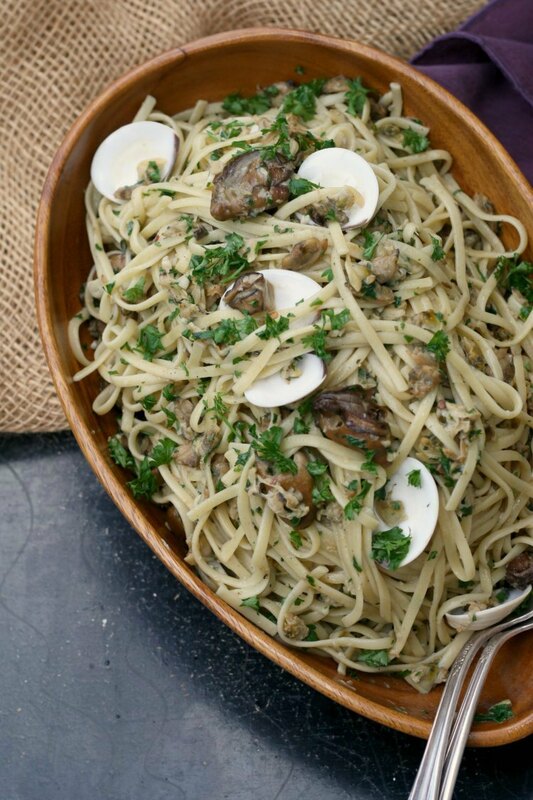 Pour in the clam juice, 1 cup of the pasta cooking water, and the basil. Bring to a boil, then reduce heat and let simmer until reduced and thickened slightly, 5-7 minutes. Add the drained oysters, clams, and cockles and stir for 30 seconds, until the liquid just comes back to a bubble. Add the drained pasta and parsley, then toss until the noodles are evenly coated; let cook for another minute, then add the remaining cup of pasta cooking liquid. Taste and add more pepper, crushed red chiles, and/or salt to your liking. Stir in 1/2 to 1 cup of heavy cream along with the pasta; let it just start to bubble around the edges. Some people don't like cheese with seafood, but I think this is good with freshly grated Parmesan cheese over the top. Add it if you like. If cockles are hard to find in your area, and you don't want to order any, simply leave them out (I won't tell) and replace them with one drained (10 ounce) can of fancy whole baby clams.